Genuine OEM Kyocera Mita 110 Volt Fuser. Kyocera Mita part number: FK-170, FK170, 302LZ93050. 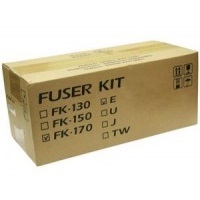 110 Volt Fuser compatible with Kyocera Mita ECOSYS FS-1035, FS-1135, FS-1320D, FS-1370DN. Compatible Kyocera Mita Toner Cartridge, Black, 7,200 page yield. Replaces Kyocera Mita part number: TK-1142, TK1142. Laser Toner Cartridge compatible with Kyocera Mita ECOSYS FS-1035, FS-1135, M2035dn, M2535dn. Compatible Kyocera Mita Toner Cartridge, Black, 7,200 page yield. Replaces Kyocera Mita part number: TK-172, TK172. Laser Toner Cartridge compatible with Kyocera Mita ECOSYS FS-1320D, FS-1370DN, P2135dn.